Girl power all the way! This was demo day at Nana's. 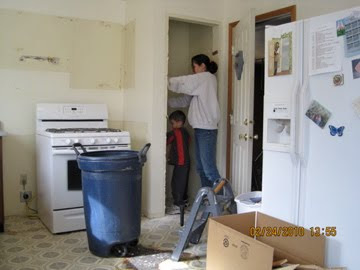 Arlene (my sister), Nana, and I took out all the cabinets. Then Branden and I started to rip out the pantry. 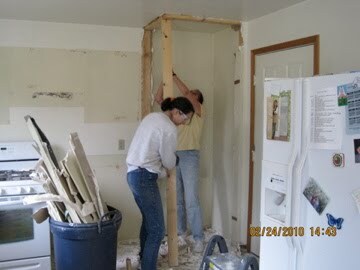 Arlene and I took turns pounding on the studs until they all broke loose. Trust me, we were sore the next day! We couldn't get the sink out so we had to lift the counter top sink and all. 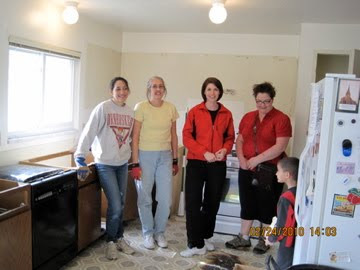 It proved to be way to heavy for us three so we called in two more super women to help pull out the counter top. Thanks Becky and Jen! Next we pulled out the carpet and pad, and then the linoleum. Work, work, work! What awesome girl power! Larry Jones took out Nana's sliding glass doors and put in the new french doors. What a pain that was to get. We had to pick it up in our trailer. Only to get it home to find it was broken because it was missing a pin. Next day my hubby and brother-in-law returned it and brought home new door #2. Then on demo day, after the old door was out, we realized the second door was the wrong door! It opened the wrong way! Nana got Lowe's to bring a new door #3 and take #2 back. What a pain!!! That is very funny that you used to live in thatcher, who are you related too? Small world! im not from here, im from St. David but have lived her for about 6 yrs! I love your blog, SUper cute!